Looking to change up the look of your 2017-2018 Grand Cherokee? Look no further than the Platinum Honeycomb Grill Inserts from the 2017 Altitude Edition Grand Cherokee. These stylish inserts will give your front end added pop to make you stand out in the crowd. The grill inserts can be used on all 2017-2018 Grand Cherokees except the SRT8 & Trackhawk. 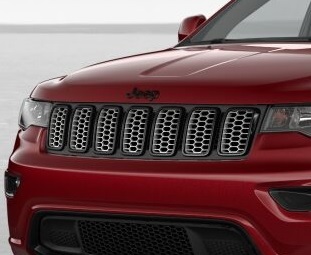 These grill inserts can also be used on the 2016 75th Anniversary model Grand Cherokees. Platinum Grill Inserts are sold as a set of 7.